Water Park Coming Soon To The Binscape! Weevily wow, don’t I have some exciting news I’m bursting to share with you! I would like to thank Jjs63 (also known as discount) for notifying me that yesterday he was lucky enough to have Bin Weevils staff member Tombalol visit his nest! Not only that.. Tombalol also let a little secret slip. As you can see, it seems as if a water park will be coming to the Binscape.. I suspect it may be like the slime pool, which was previously located at Tycoon Island. We would like to know what you think the water park will be, so get commenting! I have been sneaking around the Bin with my fellow buddy’s and I decided to check out Monty, Glamm and Mudd’s profiles, when I saw a little update to them. Firstly Monty has changed his shape, so he looks like Scribbles. Can you spot the update in the pictures below? 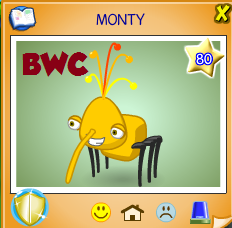 You guessed it, Monty, Glamm and Mudd have now got a staff badge but, it’s not any old staff badge, it’s what I like to call the Bin Weevils Magazine staff badge. Me and hf556, the blog owner, both love this! Well done to the Bin Weevils teamfor creating these! Also when you click them, another message comes up. Weevily wow, they must be all so busy, if they wanted a message to come up saying if you see them, the team member is working on another magazine! Check back soon, for more exclusive news! Summer Fair Updates: Black And White Room + New Prizes! Weevily wow, what a lot of changes have been going on in the in today. Firstly, what everyone has been waiting for, The Black and White room is now open at the Summer Fair and it is Bin-tastic! Here is what it looks like and Tombalol has been spotted in there also! The Black and White room is where you turn black or white and hang out with your Bin Buddies. The room on the left is where you can hang over the front of the Fun House, it’s another viewing point. Secondly, Tink and Clott are now facing off at the Summer Fair gunge tent. Which rival will you support? Thirdly, for the third and not a final time, more prizes are here and they’re Bin-tastic! I think this is the best year ever of the Summer Fair, go check the prizes out now. There is a Super Antenna Gem, where you can keep your very own Red and White Super Antenna forever! Please note: I will be away from blogging until the 24th, so Eddzy will be keeping Bin Weevil Company updated. Tombalol & Drewbian Spotted and Mulch Tastic having an Update! I thought that I should go and collect today’s ticket from the Mulch Tastic machine, but as I was going to do that, I noticed that tombalol and drewbian were hanging out there. It took some time for him to come out from Mulch Tastic but he eventually came out to reveal some secret information that was rather interesting. He told us that Mulch Tastic may be having an update in the future! We will reveal more as we get it but now you know one of the team’s top secret plans that they may be currently working on. 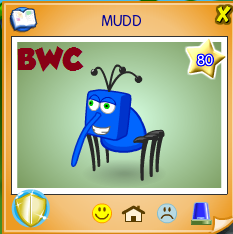 Remember you can go and check out who else is a Bin Weevils Team member by clicking here. 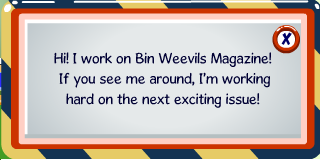 Bin Weevils Team Spotted at Weevil Post! As we all know, the Weevil Post is a great place to hang out with your friends so a large variety of Bin Weevils Team members logged in this afternoon to meet and greet everyone! I have to say that this event was absolutely Bin-tastic and I really enjoyed meeting all the team members. 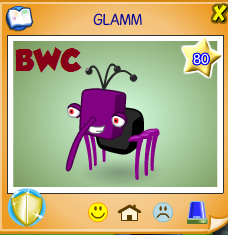 Shockingly, there was also a guest appearance of Big Weevil whom hasn’t been sighted for many years! He just randomly appeared in a large size, in his black hat and his red eyes that made a big entrance. Before this event took place, Bipolarise was hanging out with everyone as happy as can be at Flum’s Fountain. I had invited him until suddenly and most surprising went to my actual nest, isn’t that Bin-tastic? It was a pleasure to show him around my nest as he is a very kind Bin Weevils Team member! He really liked my nest rooms, especially my blue lounge that features my Hi-Tech television! Did you enjoy meeting these Bin Weevils Team members or are you attending the party on Friday evening? Please feel free to tell us below, all members of the Bin Weevil Company team really enjoyed today!